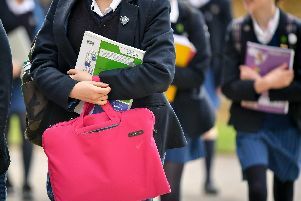 At least 570 of the county’s 617 schools contain asbestos, the bulk of them in Preston, Chorley and South Ribble, according to data released following a Freedom of Information request. The National Union of Teachers has been running a major campaign for more than a year to try to tackle the problem in the county and today national and county health and safety officer Ian Watkinson branded the figures “a scandal on a local and national scale”. He said: “We have been campaigning about this on both national and local level. Information held by the county council shows the highest number of schools known to contain asbestos are in Preston and Lancaster, which each have 66. Children, teachers and other school workers are being needlessly exposed to deadly asbestos fibres on a daily basis. There are 50 in Chorley, 40 in South Ribble, 52 in West Lancs and 22 in the Ribble Valley. The county abides by national policy which means leaving asbestos in situ unless it becomes a problem. Between September 2010 and February 2011 the county council paid out £421,322 in compensation and £63,500 in legal costs. Latest available figures, up to November 2013, show that five other claims are still outgoing. The NUT said lives are being put at risk and Ian Watkinson said the teaching unions were working together and calling for urgent action by the government. However, when asbestos is disturbed or deteriorates it becomes extremely unsafe and inhaling the dust and fibres can lead to serious illness decades later. County Coun Matthew Tomlinson, cabinet member for children, young people and schools, said: “As in all other councils around the country, most of Lancashire’s older schools contain some asbestos. “Where it occurs, it is inspected regularly and does not represent any threat to staff, children or young people. “As long as it is in good condition, well-sealed and not disturbed then it is far safer to leave it well alone. “Our qualified asbestos surveyors inspect asbestos-containing materials at least once a year and sometimes more often depending on risk. “We deal with any concerns immediately, although between inspections we do rely on schools telling us if they have noticed anything amiss, or if they have brought in their own workmen. Following a national campaign by teaching unions the Government last week published the findings of its review of asbestos policy in schools,calling for better training and guidance.